Can the Flipped Classroom Benefit Low-Income Students? 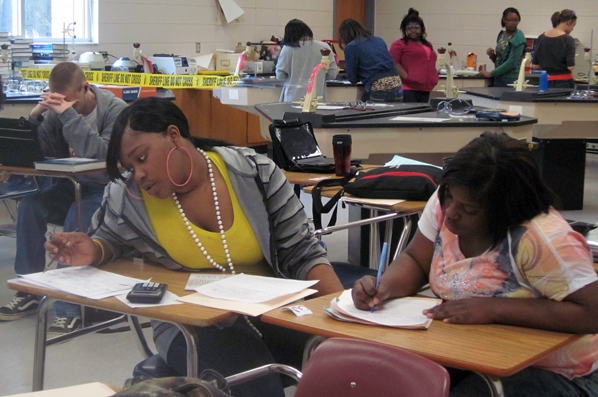 Jasmine Redeaux (left) and Nakesha Wilkerson team up to finish a worksheet in a "flipped" chemistry class at their Macon, Ga., high school, while other classmates work on a lab. When Portland, Ore., elementary school teacher Sacha Luria decided last fall to try out a new education strategy called “flipping the classroom,” she faced a big obstacle. Flipped classrooms use technology—online video instruction, laptops, DVDs of lessons—to reverse what students have traditionally done in class and at home to learn. Listening to lectures becomes the homework assignment so teachers can provide more one-on-one attention in class and students can work at their own pace or with other students. But Luria realized that none of her students had computers at home, and she had just one in the classroom. So she used her own money to buy a second computer and begged everyone she knew for donations, finally bringing the total to six for her 23 fourth-graders at Rigler School. In her classroom, students now alternate between working on the computers and working with her. So far, the strategy is showing signs of success. She uses class time to tailor instruction to students who started the school year behind their classmates in reading and math, and she has seen rapid improvement. By the end of the school year, she said, her students have averaged two years’ worth of progress in math, for example. “We do need to figure out ways that students, regardless of Zip code, regardless of their parents’ income level, have access” to technology inside and outside of schools. Other teachers in high-poverty schools like Rigler also report very strong results after flipping classrooms. Greg Green, principal of Clintondale High School in Clinton Township, Mich., thinks the flipped classroom—and the unprecedented amount of one-on-one time it provides students—could even be enough to close the achievement gap between low-income, minority students and their more affluent white peers. Clintondale has reduced the percentage of Fs given out from about 40 percent to around 10 percent. Yet anecdotal evidence suggests that flipping classrooms is a more popular practice in wealthier suburban communities where nearly all students have Internet access at home and schools are more likely to have computers in classrooms. Some skeptics say flipped classrooms still rely heavily on lectures by teachers, which they argue are not as effective as hands-on learning. Still others worry that the new practice—so dependent on technology—could end up leaving low-income students behind and widening the achievement gap. “It’s an obstacle,” said Karen Cator, director of the Office of Educational Technology in the U.S. Department of Education. “We do need to figure out ways that students, regardless of Zip code, regardless of their parents’ income level, have access” to technology inside and outside of schools. The flipped classroom can be traced to a 2008 experiment by Aaron Sams and Jonathan Bergmann, teachers in Woodland Park, Colo., who were quick to take advantage of the ability to post videos online. The concept is one small and simple way that technology can transform the way students learn. Research on the effectiveness of flipped classrooms is in the early stages, and it’s not known how widespread the practice is. Praised by advocates for letting students work at their own pace, flipped classrooms also allow teachers to tailor their instruction to individual students. At home, for example, students can watch online video lectures—recordings of their own teachers explaining concepts, say, or videos produced by other teachers or textbook companies—while classroom time can be spent working one-on-one with teachers, tackling worksheets or problem sets once given as homework, or collaborating with other students on projects. Two chemistry teachers learned that they could solve technology access issues by making DVDs of the videos for students without reliable Internet access at home. These are the tenets that Sams and Bergmann, whose book Flip Your Classroom: Reach Every Student in Every Class Every Day is due out this month, will try to spread with the Flipped Learning Network, a nonprofit organization launched this spring to train teachers from schools across the socioeconomic spectrum in the strategy. Sams and Bergmann, who are chemistry teachers, had learned, for example, that they could solve their technology access issues by making DVDs of the videos for students without reliable Internet access at home. At Westside High School in Macon, Ga., more than 85 percent of students are minorities and 78 percent qualify for free or reduced-price lunch. Chemistry teacher Jennifer Douglass estimated that about half are so transient they don’t have a guaranteed place to sleep each night. Members of feuding gangs are placed into classes alongside pregnant teenagers, she said, and parent involvement is rare. With the help of a federal grant that provided netbooks for all students, a handful of teachers in different disciplines at Westside flipped their classrooms and reported that doing so improved students’ grades—and their level of engagement. Douglass has seen a modest increase on her regular chemistry class’s final exam scores since flipping. Social studies teacher Sydney Elkin said her students’ scores on the Georgia state end-of-course exams increased, particularly for her special-education students. The semester before she flipped her classroom, about 30 percent of all students passed. In her first semester with a flipped class, she said, nearly three-quarters passed, including nine out of 10 special-education students. An infographic explaining the "flipped classroom." Click to see the entire image. Flipping does not solve all problems, though, Elkin said. Some students must still be constantly needled to do their work. And despite second and third chances on tests that act as gateways to the next level, some students still fall behind. The students at Westside are disadvantaged from the start, she said, coming from homes where parents might work two or three jobs to get by and children aren’t exposed to as many opportunities to learn as their more affluent peers. By the time they get to high school, many are far behind and haven’t developed a work ethic for school. Sams, the Colorado chemistry teacher known as one of the fathers of flipping, acknowledged that about 9 percent of his students have received Fs every year he has taught—both before and after he started delivering lectures through video in his school district. But Bergmann, his former colleague who is now a lead technology facilitator for a school in Illinois, said students were learning more and performing at higher levels, on average. He said the change also created time for him to talk to every student every day to monitor his or her progress. Some students at Westside, in Macon, Ga., said they were no longer bored in class, where they can work with classmates, ask for help and enjoy more face-time with their teachers. “It’s like having a private tutor,” junior Marvin Wesley explained. “That you don’t have to pay for,” his classmate Sarah Walker chimed in. Douglass’s chemistry class looked like an exercise in organized chaos on a weekday in March, with some students working on a lab in the back of the classroom as others, wearing headphones, danced in their seats while filling out a worksheet. Periodically, as those with their netbooks hit the play button on a video Douglass had made, the faint strains of a Rihanna parody, “Only Mole (in the World),” could be heard. Two girls new to the school had teamed up to finish a worksheet while Douglas darted around the classroom, wearing her signature white lab coat, answering questions. “It’s a first step on the way to a promising use of technology, but I don’t think people should see it as an end-all, be-all." Students said they spend different amounts of time on her instructional videos, although all must fill out a “note-taker” sheet as they watch. One might spend just 10 minutes, while another might pause and rewind, listening over and over to certain sections for nearly half an hour. Some watch the videos at home; others prefer to listen in class. Flipped classrooms are a start, but don’t take the concept of individualized learning as far as it can go, said Michael Horn, executive director of education at the Innosight Institute in Mountain View, Calif., which works to introduce innovation into education. For Douglass, though, such uses of technology are nothing short of revolutionary. She said she still has the occasional student who’ll put his head down or surf the Internet instead of working, but giving students some control over the pace of their learning improves their desire to learn. Misbehavior all but disappeared after she flipped the classroom, Douglass said, and students who hadn’t passed anything in years began proudly displaying their grades. This article originally appeared on the Hechinger Report.